(Nanowerk News) Economically viable and reliable building systems and tool sets are being sought, examined and tested for extraterrestrial infrastructure buildup. 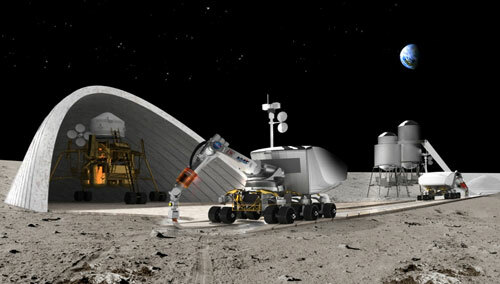 This project utilizes a unique architecture weaving the robotic building construction technology with designs for assisting rapid buildup of an initial operational capability lunar base. Using robotic technologies, this project intends to develop and test methodologies to construct certain crucial infrastructure elements in order to evaluate the merits, limitations and feasibility of adapting and using such technologies for extraterrestrial application. Elements suggested to be built and tested include landing pads and aprons, roads, blast walls and shade walls, thermal and micrometeorite protection shields and dust-free platforms as well as other structures and objects utilizing the well known in-situ-resource utilization (ISRU) strategy. Several unique systems including the Lunar Electric Rover, the unpressurized Chariot rover, the versatile light-weight crane and Tri-Athlete cargo transporter as well as the habitat module mockups and a new generation of spacesuits are undergoing coordinated tests at NASA's D-RATS. This project intends to draw up a detailed synergetic plan to utilize these maturing systems coupled with the robotic fabrication technology, tailored for swift and reliable Lunar and Martian infrastructure development. This proposal (download the final report here as pdf) intends to increase astronaut safety, improve buildup performance, ameliorate dust interference and concerns, and attempts to reduce time-to-commission, all in an economic manner. As part of this project, a figure-of-merit methodology will be created and employed to gain some quantitative insight into the efficiency of using the proposed robotic technologies to augment these other systems already in place. Automated building technologies will revolutionize the way structures are built on Earth, in dense urban environments, in difficult-to-build and difficult-to-service sites, or in remote and hostile regions of the globe. The technologies under development by our group have the potential to simplify construction logistics, reduce the need for hard physical labor by assigning humans to a strictly supervisory role, eliminate issues relating to human safety and produce intricate, aesthetically refined designs and structures at significantly reduced construction cost. Space architecture in general and Lunar and Martian structures in particular will also provide a rich new aesthetic vocabulary for architects to employ in the design and creation of buildings that employ high technology and building information modeling that is vital for optimizing use of materials and energy that is critical to building economics.